← Are asymmetrical celebrity hairstyles popular now? The Facebook campaign started at about the same time as her hilarious Snickers ad that ran during the Super Bowl. Even if you’re not up on entertainment news, you couldn’t help but notice the TV spots leading up to tonight. The buildup has gone sky high this week with publicity like her visit to Late Night with Jimmy Fallon supposedly to play rematch of Beer Pong with Jimmy. Dozens of funny promos have aired recently, and all were packed with humor. (Our favorite was a response about her being a Cougar.) One TV critic doubts the prediction that SNL will get the highest viewership tonight that it’s gotten all year or maybe in years. Meanwhile wagers are being placed on how high the numbers will go. Whatever…in a few hours we’ll know and maybe that TV expert will have eat his words! 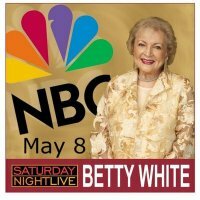 This entry was posted in Celebs, Personal and tagged Betty White, SNL (Saturday Night Live). Bookmark the permalink.